Last week, TOCI Writer Goh Zhi Qian discussed sustainability in Singapore’s context and argued for the introduction of environmental indicators to measure Singapore’s progress beyond the realm of absolute GDP growth. As much as Singapore’s economy is linked to the global economy, Singapore’s economy is also constrained by the finiteness of the global environment and resources. The leading environmental threat in the world is Climate Change. Its impact not only includes rising sea levels, but also increased frequencies of famines and droughts that would disrupt the global agricultural markets. Such environmental impact would have negative effect on world trade and both traditional and non-traditional security of nation states. The chief cause of Climate Change is anthropogenic carbon dioxide emission and Singapore’s carbon footprint is among the highest in the world. Professor Marilyn Brown of the Georgia Institute of Technology revealed that Singapore’s carbon footprint is 15.2 tonnes of CO2 (tCO2) per capita at the Innovations in Economic Development Forum last year. Singapore’s per-capita carbon emission leads all 28 countries in Asia. The USA’s carbon footprint of 5.5 tCO2 per capita pales in comparison to Singapore’s. 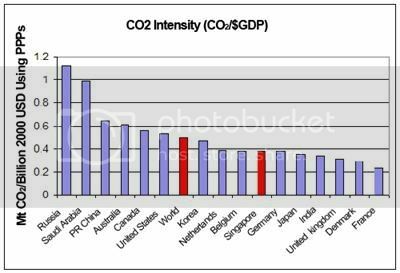 In fact, Singapore denies environmental responsibility by being a non-Annex-I party to the Kyoto Protocol and justifies its position by shifting the blame to exports and asserting that Singapore’s carbon footprint per dollar GDP is below the world average. Such blame shifting is typical of the “common but differentiated responsibility” rhetoric that is prevalent in international climate change politics. Politics aside, Climate Change remains a very real threat. Emission trading and carbon tax are the two mainstream policy instruments for curbing CO2 emission. While many have framed the debate on choosing between the two as cost certainty (carbon tax) versus environmental certainty (emission trading), it is important to note that neither system is inherently more complex than the other. Both require monitoring and enforcement – to determine taxable emissions and to guarantee payment in the case of a tax, or to ensure that allowances match overall emissions in the case of emission trading. Both approaches also must address the question of how to distribute costs and benefits. For emission trading, that means figuring out how to distribute and/or auction emission allowances. For carbon tax, that means figuring out who pays how much and what to do with the revenue. Emission trading is the poster child of the European Union’s Climate Change policy. It is a cap-and-trade system that covers energy-intensive activities (combustion installations with a rated thermal input exceeding 20 MW, mineral oil refineries, coke ovens), production and processing of ferrous metals, mineral industry (cement clinker, glass and ceramic bricks) and pulp, paper and board activities in all 27 member-states. The overall emission cap and the distribution of emission allowance to member states are determined at the EU level while the domestic distribution of emission allowance to physical installations is determined by each member state. Politicians, poor data and inaccurate economic forecast often hijack the process of achieving a consensus on emission cap and the distribution of emission allowance. For example, due to global economic crisis, many EU companies are selling their emission allowances (EUA) to raise short-term funds. This caused the collapse of the EUA price in the European Carbon Market. It now appears that EU companies are over-allocated with emission allowances. 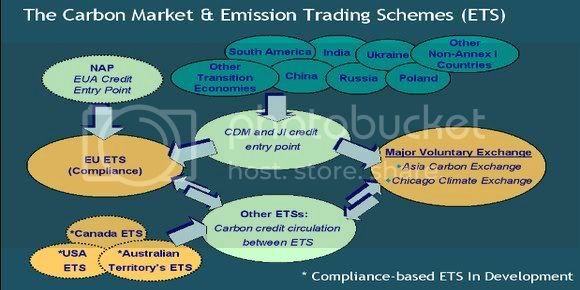 While policy makers find emission trading offers them environmental certainty since they are the ones who decide the carbon emission cap, it offers the installations under the jurisdiction of the emission trading system uncertainty with regards to supply and distribution of emission allowance. Yet the appeal of Emission trading is that it offers flexibility to installations that are under its jurisdiction. Installations may forward sell its emission allowance to raise finances to finance emission reduction activities such as implementing energy efficiency measures. A company may pool the installations it owns together for a comprehensive emission trading strategy to allow an over-allocated installation to complement an under-allocated installation internally. Emission trading markets worldwide may even be linked together. Unused emission allowances may be banked indefinitely for future consumption. There seems to be a strong case for emission trading. There is also apparent support for Emission Trading in Singapore. Mr Goh Chee Kiong, Head of the Environment and Clean Energy Unit at the EDB’s New Business Group, said that Singapore’s infrastructure, skilled manpower and reputation as a financial centre will be applied to this sector. The country’s strong push into energy – through successful courtship of key names in the solar, wind and biofuel industries – means that a cluster of clean-tech companies will be ready to service projects in the region, including Southeast Asia, China and India, he said in a 2008 Business Times interview. One can argue that implementation of a domestic emission trading scheme would help to build up the capacity of the emission trading sector in Singapore. Yet Singapore’s true intention as a non-Annex-I signatory to the Kyoto Protocol is to participate in the UN-mandated carbon market without the obligation to meet any emission cap. Non-Annex-I countries not only can participate in the international emission trading market, but also become host to emission reduction projects that generate carbon emission offsets that can be sold to Annex-I countries with Kyoto emission cap. The verification, enforcement and measurement of carbon emission offsets fall under the Clean Development Mechanism (CDM) auspices of the Kyoto Protocol. As a financial hub, Singapore could house carbon exchanges, environmental brokerages, carbon project developers and investment managers to manage a portfolio of emission reduction projects in Southeast Asia. According to Point Carbon, the size of the global carbon market has been doubling year-on-year since 2004 to reach US$125B in 2008. The lack of intention to regulate carbon emissions in Singapore only reflects the shortsightedness of Singapore policymakers to acknowledge the constraint faced by the finiteness of the global environment and resources on the Singapore economy. The International Monetary Fund (IMF) classifies Singapore as one of the 32 advanced economies, which includes other countries such as the United Kingdom, Germany and Japan. As a developed country, Singapore does not have the excuse to fail in regulating its carbon emission, even if majority of it is due to production of goods for export. A significant proportion of Germany’s carbon emission is due to production of goods for export and it is a participant state of the EU Emission Trading Scheme. Singapore’s carbon emission per US$ GDP is on par with Germany despite Germany having a far bigger population (82M) than Singapore (5M). Singapore also profits from the manufacturing activities that generate carbon emission, along with economic opportunities such as jobs and investments. Singapore owes itself a responsibility to regulate industrial carbon emission. Climate Change risk would be significant when there are costs associated with the risk. If a volcano erupts on an uninhabited island, it is not considered a disaster. However, when a similar event happens on a highly populated or poor island, there are often significant consequences for its population. Small islands, such as Singapore, are economically, socially and physically vulnerable by their very nature, because they are unable to produce all the goods and services to meet domestic needs, Due to their small land masses, small islands are typically land-resource constrained. This means that there are limited places for people to live, space for infrastructure, areas for waste disposal, agricultural production, industrial development, etc. There is no place in Singapore for Singaporeans to retreat to. Existing vulnerabilities would exacerbate the impacts of other environmental hazards and what can be done to reduce the threat of disaster due to Climate Change. There is clearly a need to mitigate Climate Change risk. Carbon tax on industrial carbon emission is a two-fold approach that reduces the likelihood of dangerous climate change. It promotes the reduction of carbon emission and facilitates the implementation of Climate Change adaptation measures. By putting a tax on carbon emissions, firms would have a permanent economic incentive to reduce their carbon emission and consume energy more efficiently. Technological and procedural changes, and subsequent technology diffusion, will lead to reduction of permit price in an emission trading market since it would be easier to meet emission reduction target, thus reducing the overall economic incentive for participants of the emission trading market to reduce its carbon emission. A carbon taxation regime is also immune to externalities and strategic behaviour by firms or non-governmental organisations (NGO), which may undermine the environmental integrity of the emission trading market. Most importantly, carbon tax is in line with the Polluter-Pays-Principle. The revenue from Carbon tax can be “recycled” back into the economy by reducing taxes on income, labour and/or capital investment. Such treatment of the tax would be part of an environmental tax reform to shift the tax burden from “goods” like labour to “bads” like pollution. According to Harvard economist Richard Cooper, such tax treatment would bring profound employment, distributional and political benefits. Most importantly, part of the carbon tax revenue can be used to fund Climate Change adaptation such as strategic stockpiling of sand and staple grains, Climate Change Insurance, raising the height of Singapore’s land annually, and reinforcing the barriers and foundations of Singapore’s reclaimed land. Emission trading is not appropriate for Singapore’s carbon emission profile. For emission trading to take place, the difference between the marginal abatement costs of the two trading parties must exceed the transaction cost. Singapore’s economy is not well diversified to contain a portfolio of industries with complementary emission reduction targets to allow the redistribution of carbon abatement under an emission trading scheme. Moreover, natural gas is virtually the only fuel for the electricity industry, the chemical industry and the pharmaceutical industry in Singapore. Natural gas is not only the least carbon-intensive fossil fuel, but it is also clean burning and a very efficient fuel. The marginal abatement cost of each industry in Singapore is not likely to differ much from one another and even more unlikely to exceed the transaction cost of an emission trading scheme. It emerged during last December’s UN Climate Change Conference in Poznan (Poland) that countries with a carbon regulation regime would implement a carbon tax on imported goods produced in countries that does not regulate carbon emission. If this is the case, would it not be better for Singapore to implement a domestic carbon tax and keep the tax revenue for itself? Moreover, this would allow Singapore to retain the flexibility to determine its carbon tax rate to balance between the incentive the reduce carbon emission and the national interest to retain MNC manufacturing activities in Singapore. TOC International is a group of Singaporean writers who are based overseas. If you would like to be a part of the team, do drop us an email at: [email protected] .